For media inquiries, please email proof@utoronto.ca. Food security and your health. Knoll J. Upstream. December 4, 2018. Hunger in a city of plenty. Lewsen S. The Local. October 3, 2018. Basic income: A no-brainer in economic hard times. Mah C. The Conversation. August 2, 2018. Bare shelves at one Ontario food bank illustrate summer struggle. Duhatschek P. CBC News. July 2, 2018. PEI ties for highest rate of food-insecure children among provinces. Yarr K. CBC News. June 26, 2018. One in two Indigenous children in danger of going to school hungry. Green M. Toronto Star. June 21, 2018. ‘This isn’t solved by giving somebody a bag of food’. An interview with food insecurity expert Valerie Tarasuk. Devet R. Nova Scotia Advocate. May 1, 2018. Saul N. Community Food Centres Canada. April 19, 2018. Whilst feeding people let’s do as much as we can to highlight the reasons why. Mayfield S. Good Food Oxford. April 16, 2018. Study finds moms living in poverty struggle to breastfeed their babies longer. Szklarski C. National Post. March 21, 2018. ‘We’re failing some children:’ Women struggling to put food on table may be less likely to keep breastfeeding. CBC News. March 20, 2018. Women with food insecurity less likely to breastfeed: U of T Study. Oldfield J. U of T News. March 19, 2018. Women in food-insecure households stop exclusive breastfeeding sooner. Young L. Global News. March 19, 2018. Studying Food Insecurity — With a Hole in the Data. Oldfield J. University of Toronto Faculty of Medicine News. December 19, 2017. 3 reasons reducing food waste won’t reduce food insecurity. Yarr K. CBC News PEI. December 12, 2017. Community event calls for income-based response to household food insecurity. Wellington Advertiser. November 3, 2017. Corporate Food Waste Isn’t the Way to Solve Hunger in Canada. Dachner N, Tarasuk V. Huffington Post. October 25, 2017. 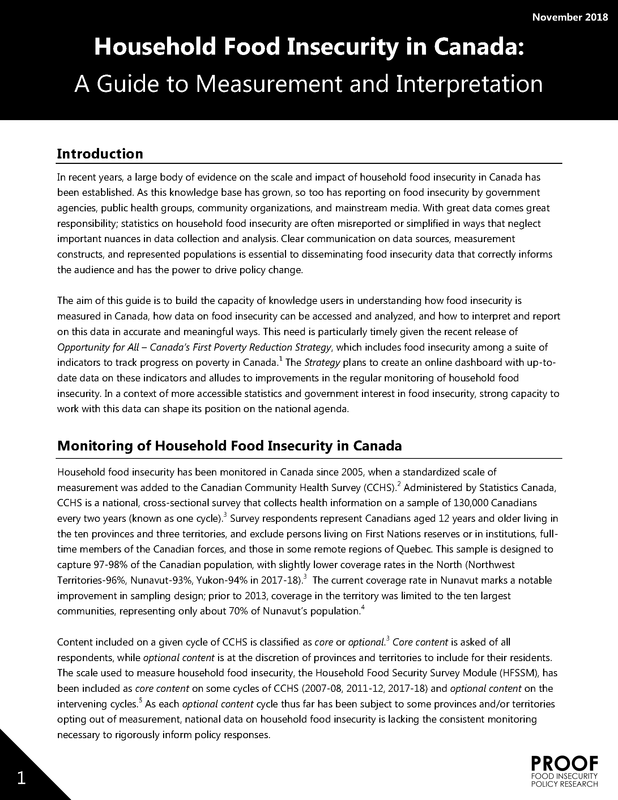 Food waste and food insecurity in Canada. Dachner N, Tarasuk V. Upstream. October 23, 2017. Changing the rules in the hunger game. Bridgeman T. Guelph Today. October 20, 2017. Kimmett C. The Walrus. July 6, 2017. 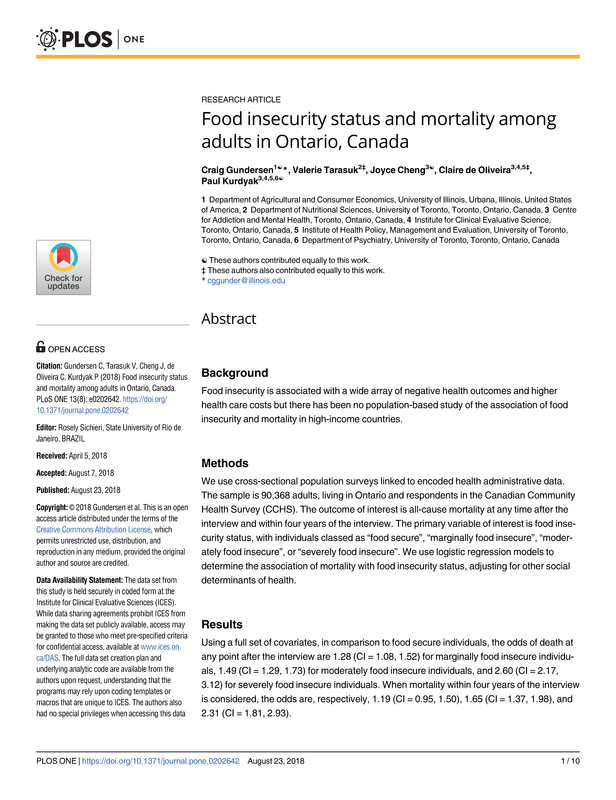 Public health experts blame Ontario government for gap in food insecurity data. Richa S. Globe and Mail. July 4, 2017. Guaranteed income is a solution to food insecurity: report. Desjardins L. Radio Canada International. July 3, 2017. 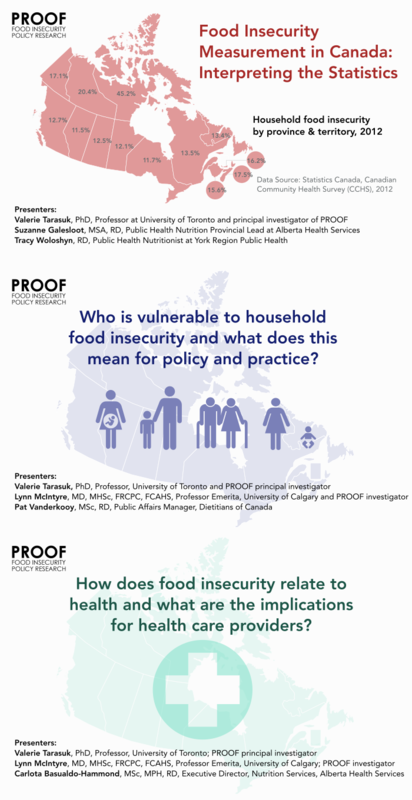 A Conversation with Naomi Dachner on Food Insecurity and Health Care Costs in Canada. Food Tank. June 23, 2017. Nunavut gets failing grade on food security. Wilson H. Canadian Geographic. May 24, 2017. We Need To Keep The Pressure On Our Politicians To End Poverty. Saul N. Huffington Post. May 24, 2017. La malnutrition au Nunavut : « une crise nationale », disent des experts. Simpson V. RateMDs. May 21, 2017. Nunavut’s Food Insecurity Is ‘Far Greater’ Than The Rest Of Canada: Report. Food insecurity in Nunavut ‘should be considered a national crisis,’ expert says. CBC News. May 19, 2017. Ten Things to Know About Social Assistance in Canada. Falvo N. Behind The Numbers. May 9, 2017. A Basic Income and Food Security Strategy: Is Ontario Tackling Food Insecurity? How do we solve hunger? Taking part in the holiday spirit of giving – Does food charity alleviate hunger? Should the security provided by Old Age Security be age-centric? Aleksandra Sagan. The Canadian Press. February 19, 2016. Chew on this: Why do we accept poverty in a nation as rich as Canada?